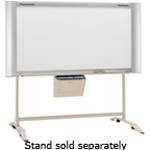 Connect your meetings, brain storming sessions, scheduling and training with this 55" by 65" plain paper Panaboard. It features a 35.4" by 55.1" panel size with four endless type panel surfaces and includes one non-glare screen for projectors. File Document Management System software easily archives, retrieves and disseminates your meeting notes. For your convenience, this Panaboard can be wall-mounted or used with the mobile floor stand (sold separately). This model comes standard with Document Manager and Document Viewer utility software. Meeting content that appears on the Panaboard screen can become your meeting minutes with notes through the Document Viewer feature. Using Document Manager, you can quickly and easily file and distribute the meeting minutes by converting the file into common electronic file formats, including BMP, TIFF, JPG, PNG and PDF. With the included Printer Driver, this Panaboard can also work as a PC printer. If you need to print documents during a meeting, the built-in Plug and Play USB port makes it easy to print out your documents right from the Panaboard. In addition, with the included TWAIN driver, you can scan the image on the Panaboard screen as image data to your computer with just one click. You can also control the Panaboard operation right from your computer.